The Cancer Institute at Florida Hospital Celebration Health intensified its focus on malignant mesothelioma with the addition of innovative thoracic surgeon Dr. Farid Gharagozloo in 2015. Gharagozloo was the first to use minimally-invasive robotics as part of aggressive surgery for pleural mesothelioma, believing it could change future treatment of the disease. Robotic thoracic surgeon Dr. Farid Gharagozloo talks about why Florida Hospital Celebration Health is a top treatment center for mesothelioma patients. 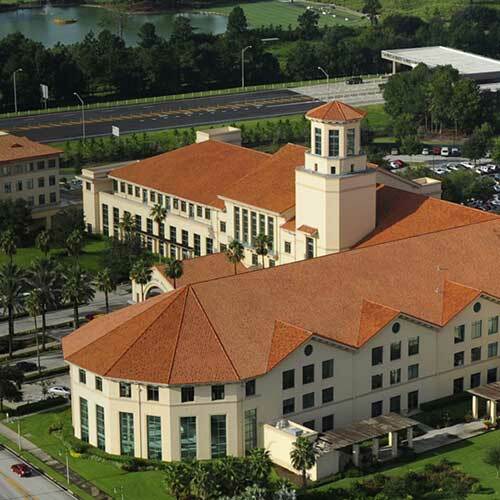 The resort-like Florida Hospital Celebration Health is located in the Walt Disney World-planned community of Celebration, in the shadow of Central Florida’s booming tourism industry. Opened in 1997, it has become a global leader and model for future facilities, recognized for its innovative approach to health care. Doctors at Celebration Health perform more than 2,000 robotic surgeries each year, more than any hospital in the nation. Gharagozloo, medical director of thoracic surgery, has been a longtime leader in minimally invasive surgical techniques for benign and malignant diseases. He left the University of Arizona Cancer Center to launch the thoracic surgery program at Florida Hospital Celebration Health, where the Global Robotics Institute already was housed. Robotics involve tiny instruments controlled remotely by a surgeon at a nearby computer board. It allows a surgeon to be more precise and improves maneuverability. With a tiny camera attached to the instruments, it also can serve as a final diagnostic tool before aggressive surgery. The use of robotics often leads to a shorter, post-surgery recovery. Celebration Health handles a myriad of cancers, excelling in early detection, diagnostics and treatment. The hospital relies on research from labs worldwide. Each patient is handled from start to finish by a specially trained care coordinator. Gharagozloo brought much of his own thoracic surgical team when he made the move from Arizona, making sure it was a seamless transition. He brought his surgical first assistant, surgical nurse, nurse practitioner and his office manager. The upscale atmosphere at Celebration Health often gives patients an added sense of confidence in a multidisciplinary approach to healing. Celebration Health has been recognized for its technological breakthroughs, clinical innovations and groundbreaking solutions in fighting incurable diseases. Robotic thoracic surgeon Dr. Farid Gharagozloo talks about his role at Florida Hospital Celebration Health. Its proximity to Walt Disney World has made it an international destination hospital for advanced and primary medical care, attracting specialists such as Gharagozloo and their novel techniques. Disclaimer: Florida Hospital Celebration Health has no professional affiliation with Asbestos.com. I would like help getting in contact with this cancer center and other mesothelioma specialists about my treatment options.